Last summer I noticed these white growths while doing some plant surveying work along Blue Lake Creek. At first glance I thought maybe they were rootlets coming from the trunk of the tree (either Red Alder or Sitka Willow, I can’t remember which). Closer examination revealed that they were actually growing directly from the moss. 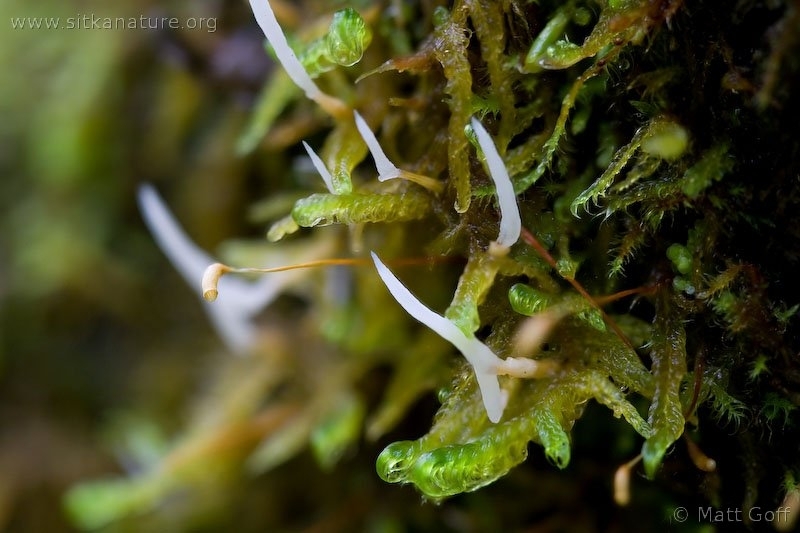 The only thing I have noticed growing out of a moss like that is sporophytes, but there are also sporophyts present and they seem different enough to make me think that the white growths are not a stage in the development of the sporophytes (though perhaps I’m wrong about this?). I believe the moss is a species of Hypnum though I am not sure which one. So far, this is the only time I have noticed anything like this, so I am tempted to say it must not be very common. However, experience has taught me that I overlook many things, so I don’t really know how common it might be. In any case, I would appreciate any suggestions as to what might be going on with these growths. A note on the photo: the image seen here was created from 3 initial images, each focused at a slightly different point. They were then stacked to give a greater depth-of-field using CombineZM. It didn’t work perfectly, so there is a little bit of a funny look to some parts of the photo. This entry was posted in bryophytes, identification and tagged Blue Lake Creek, identification, Moss. Bookmark the permalink. The moss species appears to be Sanionia uncinata (Amblystegiaceae). I assume the light-coloured outgrowths are fruiting bodies of a fungus. Nice photo! I think it is Eocronartium muscicola. Check the link above (pdf file). Thanks for the response. I appreciate the help. Eocronartium muscicola seems to be a pretty fascinating little fungus.